When it comes to searching for the perfect RV to road trip with, fuel efficiency is one of the top items to be looking for! 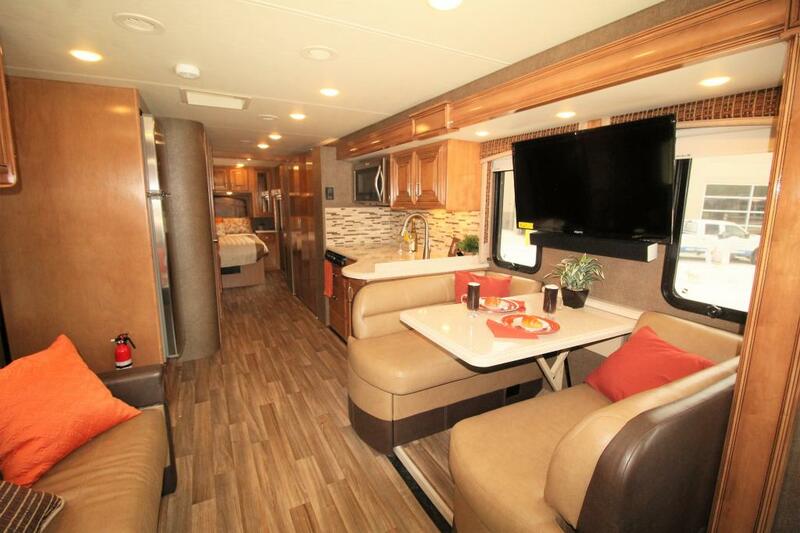 In addition to great gas mileage, the feature list of a class A motorhome is unmatched. For road tripping families, taking out gas money can put a huge dent in your wallet, leaving less options for adventure. To assist you in your search for the perfect RV, we’ve compiled a list of the top 5 best class A motorhomes that will save you money on fuel. 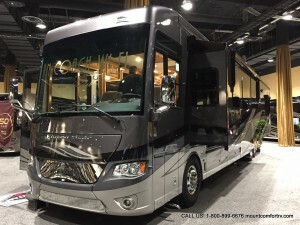 What puts an RV on the list: There are tons of class A motorhomes available in the market right now, regardless of whether they use gas or diesel. But, diesel has been proven to provide better fuel economy. The motorhomes that made the list are all 2018 model diesel class A motorhomes with respectable user and critic ratings. These 2018 models all have better gas mileage than older models because designers are seeing the demand for lower gas mileage rates on RVs. 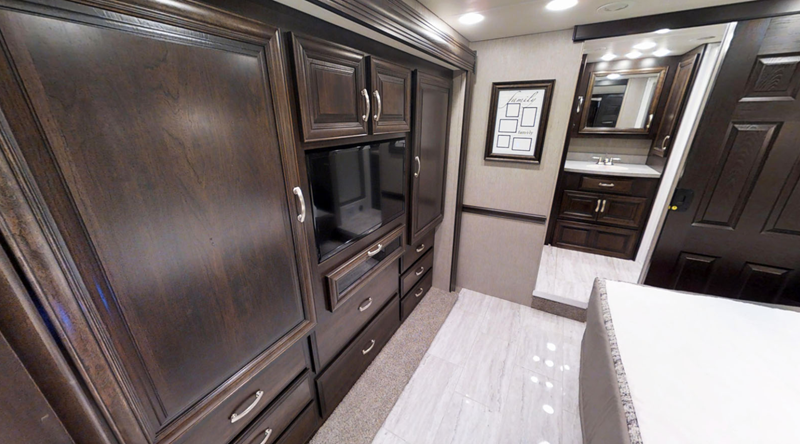 View All Thor Palazzo Class A Motorhome Floorplans! Why we recommend the Thor Palazzo Class A Motorhome: The Palazzo confirms that not all lightweight models have better gas mileage than the rest of the RV world. 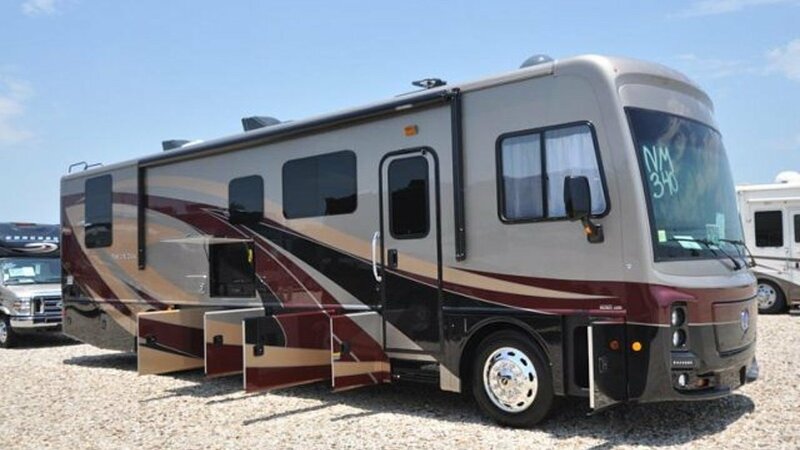 This motorhome tips the scales at 26,000 lbs at the very least, and still manages to offer a phenomenal mileage of 7.5, and can get up to 12.9 when it’s on all nines. In addition to this, you won’t have to sacrifice customization with its 6 different available floor plans. 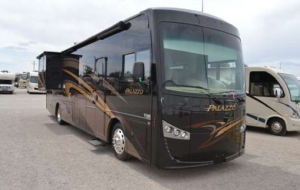 If you’re interested in this fantastic class A motorhome and need to start somewhere, we recommend taking a look at the Palazzo 33.3 and the Palazzo 33.4 floorplans. As far as features go, you can expect the best of the best, as the Thor Palazzo is a class A. LED lighting and a 40-inch TV in the living area are common features in this 2018 model. When you look at features like dual 13,500 BTU roof air conditioners and a 35,000 BTU furnace, you know the Palazzo is luxury at its finest. 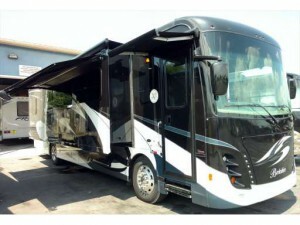 You won’t go wrong with this beautiful motorhome by Thor (whether for fuel economy or feature hunting)! 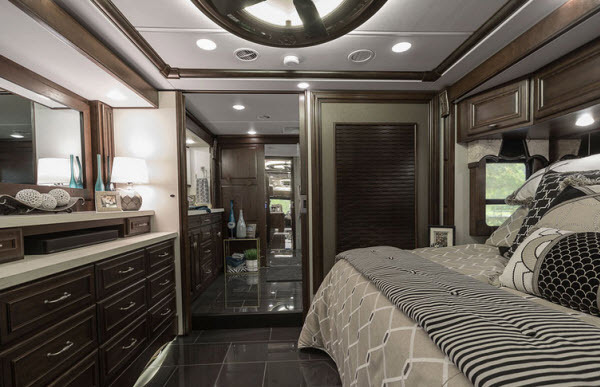 View All Forest River Berkshire Class A Motorhome Floorplans! Why we recommend Forest River Berkshire Class A Motorhome: Traveling for long intervals will be an exciting and a cost-friendly endeavor with the Berkshire class A motorhome by Forest River RV. You can expect your mileage to hit 8 to 8.5 miles per gallon, or even as much as 12.5 miles per gallon in the right conditions. It provides you with features that will make your RVing experience a memorable one. 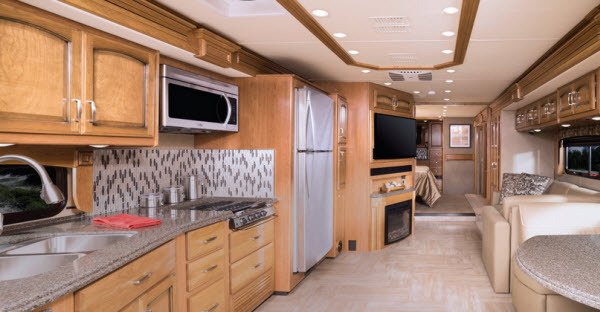 From the 48-inch TV in the living room, other small TVs on the outside and in the bunkhouse, to the beautifully laminated kitchen countertops, the Berkshire has it all. Safety is of the utmost importance in this class A motorhome, complete with CO (carbon monoxide) and an LPG detector. The 6 different floor plans allows you a variety of options to select from. Of those floorplans, these two in particular caught our eye: the Berkshire 38A 360HP and the Berkshire 39A. View All Winnebago Grand Tour Class A Motorhome Floorplans! Why we recommend the Winnebago Grand Tour Class A Motorhome: With 3 floorplans to choose from–the Grand Tour 42HL, the Grand Tour 42QL and the Grand Tour 45RL– Holiday Rambler certainly designed a beautiful class a motorhome. As far as mileage goes, this diesel motorhome has a minimum mileage of 7 miles per gallon, and can go up to 11.3 miles per gallon. You’ll save a lot on your fuel bills with this fantastic RV! 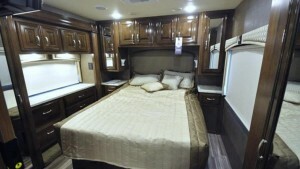 Luxury has never been wanting in any Grand Tour class A motorhome. Aside from the optional equipment that you can choose for yourself, the standard equipment provides you with a 50 or 60-inch (depending on floorplan) 4K UHD TV, quartz countertops in the kitchen, LED lighting, and a security safe, making your camping trip a very comfortable and convenient one. The Winnebago’s Grand Tour is definitely one of the most feature-rich class A motorhomes that has a great mileage to boast of. 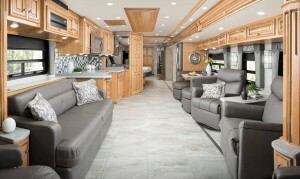 View All Newmar Dutch Star Class A Motorhome Floorplans! 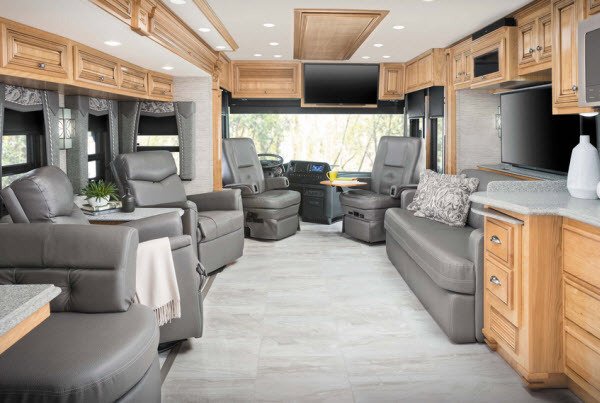 Why we recommend the Newmar Dutch Star Class A Motorhome: Akin to the Thor Palazzo, Newmar’s Dutch Star has a great gas mileage that you’ll love, even as it is a heavier recreational vehicle. 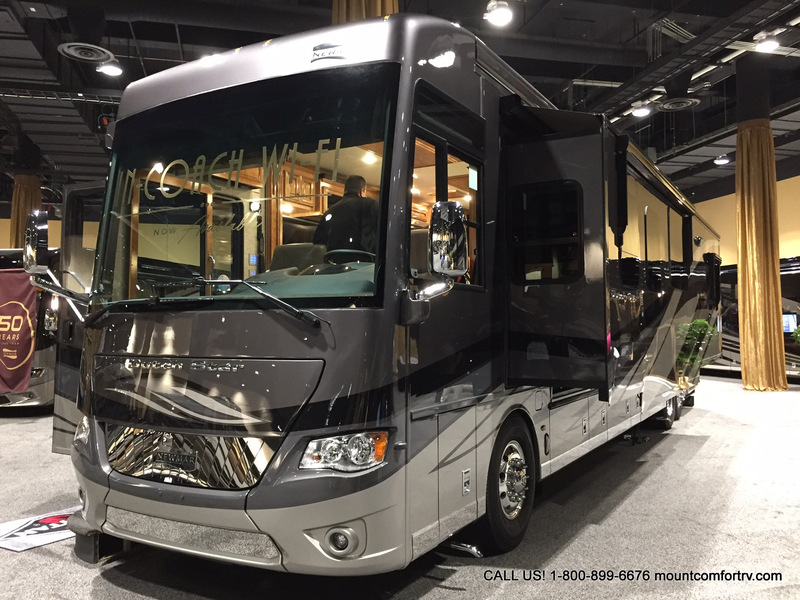 At 8 miles per gallon and reaching a maximum of 11 miles per gallon, it is less about worrying over money, and more about enjoying the adventurous Newmar Dutch Star RV experience! Our caption for the Dutch Star is aptly so, as any of the 18 floorplans in this class A motorhome is just as amazing and loaded with features as the next one. 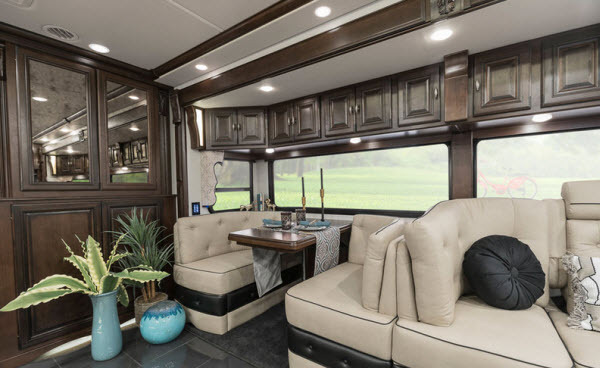 These amenities include a 10 watt solar panel so you can charge your chassis battery, USB charger outlets that provide you with the opportunity to update your Instagram even when on the move. 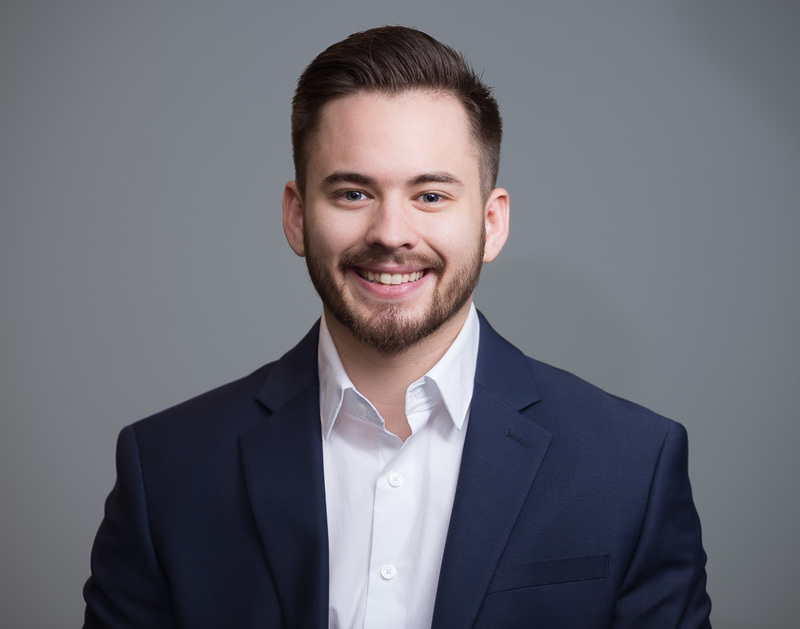 In addition, upgradability is available with options such as an energy management system, recessed docking lights, and a transfer switch with a surge protector. We specifically recommend checking these floorplans out: Dutch Star 4312 and Dutch Star 4362. 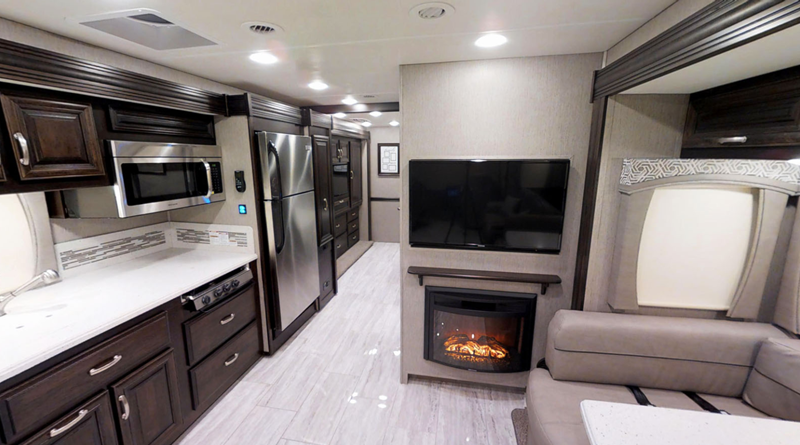 View All Holiday Rambler Navigator Class A Motorhome Floorplans! 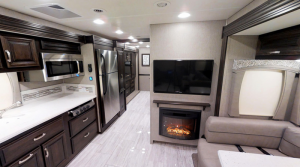 Why we recommend Holiday Rambler Navigator Class A Motorhome: Navigate your way to the camping spot you’ve always wanted to visit with the Navigator by Holiday Rambler. No worries about exorbitant traveling costs (even when the weather conditions are at their worst), you can’t go any lower than 6 miles per gallon in this motorhome. Users have gotten so much as 10.6 miles per gallon, an excellent number for all of the adventurers! If you’re a family of 4 or 5 people, the 2 floor plans–Navigator 38F and the Navigator 38K– are perfect for you. This class A motorhome is 40 feet long, giving you and your family the space you’ll want on long vacations. Features such as the soft touch residential style seating, expandable L-sofa and a U-shaped dinette gives it more of a convenient and comfortable atmosphere. 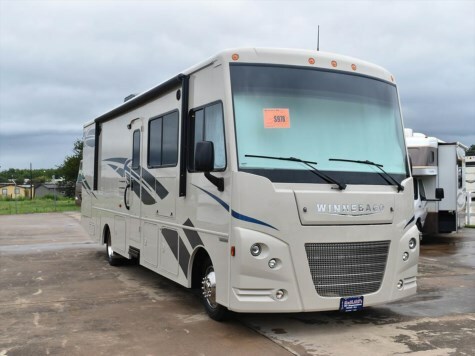 The next time your little champs are forcing you to take them someplace nice, you’ll definitely enjoy the trip with the Holiday Rambler Navigator class a motorhome. 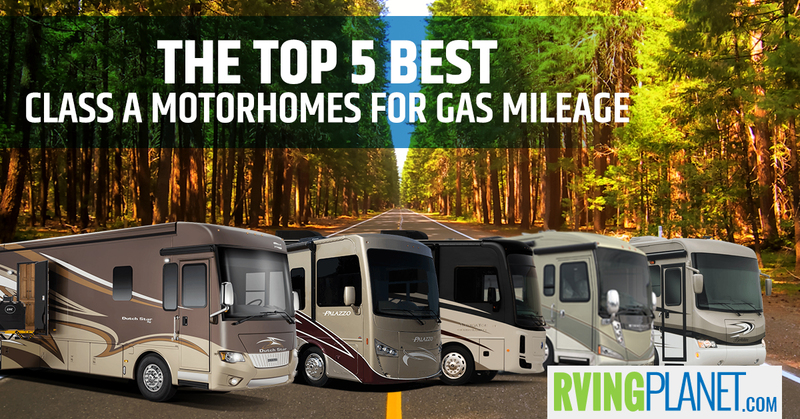 To save on those fuel bills, we implore you to take a look at this list of the best class A motorhomes for gas mileage and consider them for your next purchase. 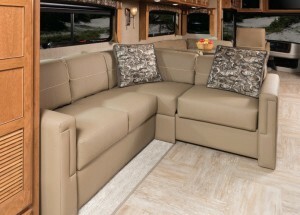 In addition to the costs you’ll be lowering, Class A motorhomes are as luxurious as an RV can get! 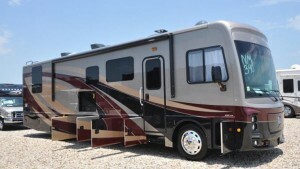 Share with us your favorite Class A Motorhome in the comments below!